Chicago native Catherine O’Connell is the author of The Last Night Out (Severn House/Black Thorn), Well Read and Dead (Harper), Well Bred and Dead(Harper), Skins (Donald I Fine) and soon to be released First Tracks (Severn House July 1, 2019). A graduate of the University of Colorado School of Journalism, Catherine worked in a number of fields to gain insight into the many walks of life incorporated into her novels including the hotel and restaurant industry, commodities markets, and as a sales executive. 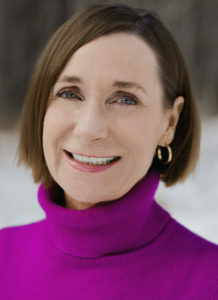 Catherine O’Connell is a member of Mystery Writers of America and sits on the boards of Aspen Words, the literary branch of The Aspen Institute, and English in Action, a mentoring program that teaches English as a second language. She serves as a moderator of the Sharing Shakespeare program at the Aspen Institute. Catherine has appeared on ABC, NBC, CBS, the Cox network and numerous radio shows including WGN Radio’s After Hours with Rick Kogan. An inveterate traveler, wine enthusiast, skier, biker and hiker, she divides her time between Aspen, Chicago and Paris.